Playing Quest For Gold slot game is an adventure in every sense of the word. Join us at NovomaticCasino.co.uk on an adventure as we go on a quest for big wins! This game channels an Indiana Jones vibe which you’ll notice from the minute you load up the game. The explorer in Quest For Gold slot game bears an uncanny resemblance to Mr. Jones himself and he’ll help you on your quest for wins with his keen eye, his trusty map and his monkey assistant. Quest For Gold slot has everything from free games, to super games, mega games and more! You won’t believe the gold this explorer can help you find! In order to get payouts in Quest For Gold slot game, you’ll need to spin two or three or more matching symbols (depending on the symbol), so really your quest for wins is a quest for matching symbols. The matching symbols will need to fall on consecutive reels, in a winline, from left to right. Each payout will vary according to the size of your bet as well as the symbol itself, as some are higher-paying than others. The lowest-paying symbols are the card value symbols from 10 through to the Ace. Then there is an emerald and gold pendant, a golden Mayan-style temple, the cheeky monkey assistant, the explorer and his map. The explorer is extra special as he substitutes for all other symbols except the map, which is the Scatter symbol. This Scatter symbol pays wherever it lands and also triggers free games! 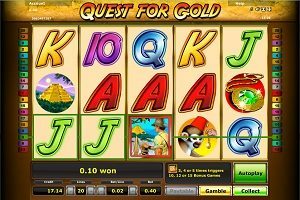 In Quest For Gold slot game you can win a significant number of free games by spinning three or more Scatter symbols: the map. 3 map Scatter symbols triggers 10 free games, 4 triggers 12 free games and 5 triggers 15 free games! During these free games, your wins will be multiplied by a multiplier of up to x10, chosen before you start the free games! Free games are a great way to win super games and mega games too! Quest For Gold slot game isn’t all about new features and special bonuses! There are also some familiar, standard features which regular NovomaticCasino.co.uk slots players will love. Quest For Gold slot game can be put into autoplay mode where the reels will spin automatically, without you having to lift a finger! This is great for busy players who are playing on the go or on mobile! Quest For Gold slot game also has a gamble feature. This gamble feature is great for turning small wins into big ones! To go up a level in the gamble game, you’ll need to click the step while the light flashes on. If you time it right, you’ll move onto the next step with double your win, or more cash and more super or mega games. Whether you get super games or mega games will depend on the size of your bet. Quest For Gold slot game is not the only game we have here at NovomaticCasino.co.uk. Browse through our extensive list of other slots and video slots and go on a quest for your new favourite game! We also have table games, card games and live casino games. Our live casino games are brought to you using the latest technology and enable you to play live at real tables with real dealers! Choose between: Live Poker, Live Blackjack, Live Baccarat and Live Roulette and enjoy an authentic casino vibe from your own home!